Bali vacations very pleasant indeed. This island is the most popular tourist destinations and always crowded by tourists. Bali friendly for visitors from various walks of life. You can sunbathe on the beautiful beach, watching the exciting cultural attractions, or cool off in the natural countryside away from the crowds. Tours in Bali attractions suitable for family holiday, have fun with friends, enjoy a special honeymoon, meetings and adventurous, cool down, sunbathing, shopping and diving or surfing can you do in Bali. Bali is a tropical island which is very famous in the world with beautiful beaches, a magnificent mountain scenery and culture and hospitality of an amazing community. You could traveling in Bali with cheap cost and can also break with the splendour of a price more. To make your holiday in Bali you can order different types of Bali vacation packages which are already equipped with hotel accommodations/villas, tour guide, rent a car to get around. Your vacation will be more efficient. Kuta Beach is one of the most famous attractions in Bali. It's not yet complete your holiday in Bali if you don't go to the beach that never deserted from the tourists. This is a gathering place for tourists from various countries of the world. Kuta offers stunning sunset. You can enjoy the waves on kuta with surfing. You can also do a variety of other activities, such as swimming, playing beach volleyball with friends, sunbathing or toured with rent a bike. In addition to the Kuta Beach offers in Uluwatu rows high waves for surfers, pas. Not far from Uluwatu, there is a romantic dinner at the edge of the beach, Jimbaran. You can select the desired restaurant, and enjoy a dinner with the soothing sound of surf. If you have a passion in the field of photography, Bali is a haven. There are a Tanah Lot is very photogenic. don't forget to visit Garuda Wisnu Kencana, famous landmarks and never deserted visitors. 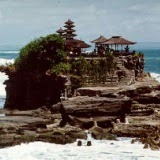 Not only beaches, Bali Indonesia also offers many other tourist destinations that you must visit. You can visit the mount Batur by UNESCO as part of a Global Geopark Network. Ubud rice paddy with a worldwide, offering views of the green shade. Also, the serene atmosphere became a gathering place for the traveler who is looking for tranquility from around and inside himself. And, the art market Sukowati will make women forget themselves. You will be hard to resist the temptation of this one. Bali does offer an amazing vacation experience. Bali vacation package to make your travel planning simple and very affordable. Discover a wide range of Bali tour packages on our business network to compare service specials for foreign tourists, and a booking system is easy and secure.